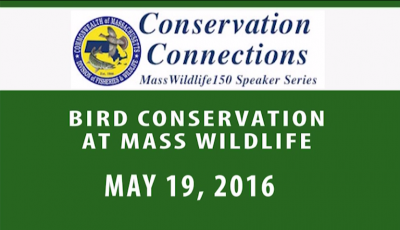 WTV recorded the May 19th Bird Conservation at MassWildlife. Watch the presentation here. Andrew Vitz, MassWildlife’s State Ornithologist, discussed the many ways MassWildlife is promoting bird conservation across the Commonwealth. Topics included the return of Bald Eagles and Peregrine Falcons, Piping Plover and Roseate Tern conservation, grassland and shrubland bird management, and what is being done to support nesting Common Loons and American Kestrels. Attendees learned how to contribute to bird conservation through a number of citizen science activities. June 9: American Chestnut Restoration in Massachusetts. Most people are unaware of the enormous ecological disaster that the loss of the American Chestnut tree represents. Blightresistant American Chestnut seedlings, painstakingly developed and now planted adjacent to MassWildlife’s Field Headquarters, are a major step toward reintroduction of the species into the wild. Join Lois Breault-Melican from the American Chestnut Foundation as she discusses the history and future of this important tree. Participants can view the trees and learn about restoration volunteer opportunities. July 21: Into the Night: Exploring Moths and Other Nocturnal Insects. Discover a world of beautiful colors and patterns and extraordinary diversity when you learn simple techniques to observe moths from MassWildlife’s Invertebrate Zoologist Michael Nelson. From luring techniques and rearing methods to identification tips, novice and experienced naturalists alike will learn something new. After the lecture, attendees will have a chance to view live moths at a luring station (light and sheet) outside the building. Talk begins at 8:00 P.M.
August 4: Prescribed Fire: Maintaining and Restoring Wildlife Habitat throughout MA. Did you know that many rare plants and animals in Massachusetts rely on periodic fire to thrive? Join Tim Simmons and Caren Caljouw, both part of MassWildlife’s prescribed fire team, to learn how these special fire-adapted communities are being restored on public lands like Inland Barrens in central Massachusetts and Sandplain Grasslands on the Cape. Also, find out how members of the public are helping catalogue these fire-adapted habitats. August: MassWildlife Habitat Showcase Walks in Hardwick, Falmouth, Montague, Windsor, and Newbury. Walks will take place at various dates during August, check Mass.gov/dfw/Conservation-Connections for updates. September 18: Sandwich Fish Hatchery Tour. Did you know that the Sandwich fish hatchery annually produces about 75,000 trout that are stocked into Massachusetts water bodies? The Sandwich facility is the oldest of MassWildlife’s five fish hatcheries. Join us for a tour of the rearing facilities and raceways and see Brook, Rainbow, Brown, and Tiger Trout in different stages of growth. Check Mass.gov/dfw/conservationconnections for tour times and details. September 22: MassWildlife Hatchery History. Shortly after its founding 150 years ago, MassWildlife began rearing and stocking fish. In fact, Massachusetts was the first state in the country to initiate a fish culture program. Today more than 500,000 trout are produced by the Division’s five fish hatcheries for anglers across the Commonwealth to enjoy. Join Ken Simmons, MassWildlife’s Chief of Hatcheries, for a fascinating look at the history of the agency’s longest running program. Also, historical photos and other artifacts from the hatchery and stocking program will be on display.